I am getting tired of making these. We have lost too many good ones this year. And the year before that. And the year before that. I feel like ever since Cory Monteith, it has just been one loss after another. And like Cory, this one was taken far, far too young. 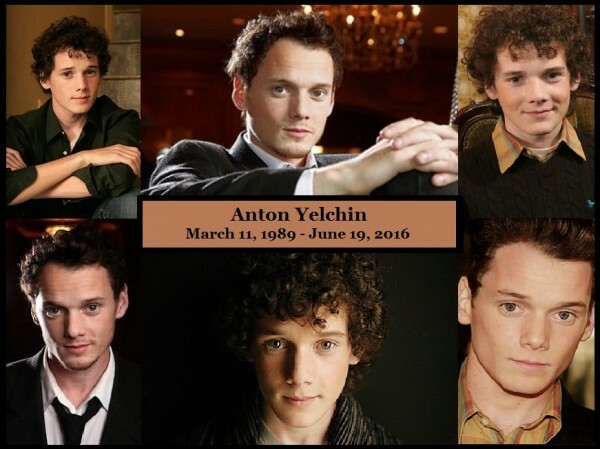 I remember first seeing Anton in an episode of ER. So young and quiet and conveying the oldest soul, like watching a boy with the wisdom of thousands of years under his skin. But then I'd see videos of him behind the scenes or on the red carpet, and he just seemed like a silly, sweet dork. Good-hearted, very intelligent and just plain sweet. Having watched his work since he was 11 years old, it is very hard to think of him as being gone. We can only hope he didn't suffer. I honestly can't believe we lost another one. This has to stop. I know. I can't stand it. All this senseless violence. I read something yesterday that said he probably died within a minute from a crushed chest resulting in asphyxiation. Totally awful to think that one could be here one minute, do something like get out of your car, and end up dead the next. I read something yesterday that said he probably died within a minute from a crushed chest resulting in asphyxiation. That actually makes me feel a bit better, to know he went so quickly, though an absolutely terrible way to go, as he must of known he was dying. But better than being stuck there like that. Totally awful to think that one could be here one minute, do something like get out of your car, and end up dead the next. I think that's why this one hit me so hard - (besides his young age) - he probably jumped out real quick to get the mail or something and that was the last thing he did. It just happened. And I can't quite shake it, despite it not being anyone I know in RL or anything. I hadn't hear this news. Very sad, indeed.